"'Nita and I were best buds in high school. 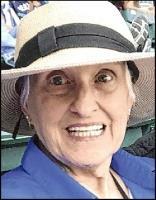 We had the best..."
"'Nita and I grew up together in Littleton, CO and graduated..."
"Nita was a beautiful, fun & much loved member of our..."
"Nita was my very best friend. She had my back no matter..."
"As a teenager working in an office, Nita (as I called her)..."
Anita Beth (Garrison) Gillard passed away peacefully on October 3rd, 2018 at the age of 75 with her two children, Greg Gillard and Kelly Golden, by her side. She was born in Pittsfield, MA to Robert and Betty Garrison. She was the oldest of their four children. After her mother passed away she gained three more siblings through her father’s remarriage. Anita grew up in Littleton, CO and graduated from Littleton HS in 1961. She moved to Denver in 1961 where she met her future husband, Ed. They met on the stairway outside her apartment and were married just three months later July 12th, 1963. In 1966, they welcomed their first child, Greg and in 1969 their second child, Kelly was born. The family spent some years living in central Washington as Anita supported her husband while he finished his Bachelor’s degree. She made many beloved friends during this time, her closest being Sue Tindal Brima. The family relocated to Vancouver, WA in 1973. Anita spent the next 15 years raising her kids and working for small businesses in Vancouver. She was incredibly intelligent and had a natural gift with computers - She was a computer nerd before they were considered cool. Anita loved to read, work on computers, quilt, craft, and run amuck with friends especially her bestie, Leslie Currie. Anita was diagnosed with lung cancer and pulmonary fibrosis in 2015. She was given six months to live, but fought her way through three more years keeping her bright smile, her fun personality and her optimistic nature to the very end. She spent the last month of her life in Hospice care at Kelly and Jay’s home surrounded by her sisters, Nancy and Mary Ann, her friends, Sharon, the Hutchinson’s, Raymond, Lisa, Sue, Linda, Mary Jo, Mary Kaye and Leslie, her kids Kelly, Greg and Jay, and too many visitors to name. Anita was a loving wife, an amazing mom to Greg and Kelly, the best Nana to her grandkids, and a faithful friend to many. Anita is survived by her children, Greg Gillard (Lanice) and Kelly Golden (Jay); her grandchildren, Bailee and Trey Rogers, Megan, Carly and Cody Golden, Cal and Jack Gillard; her siblings, Nancy Vandermyde (Dan), Jim Garrison (Kathleen), Brenda Ribbens (Steve), Mary Ann Shirbroun (Dan), Becky Estes (Scott) and Cindy Conger; her step-mother, Joanne Meury; along with many other relatives and dear friends. She was preceded in death last year by her huband of 55 years, Ed Gillard. A celebration of her life with be held on Nov. 10th at the Red Cross Building on Officer’s Row from 5:00-8:00. Memorial donations can be made in Anita’s honor to the Pulmonary Fibrosis Foundation or Kaiser Hospice.